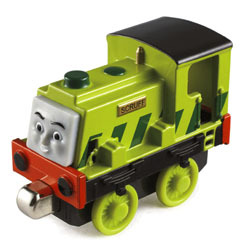 Scruff was brought to Sodor to work at Whiff's Waste Dump. He hates being cleaned and, when Thomas once tried to have him cleaned, he ran away and hid in a siding until he was coaxed out with the promise of being allowed to shunt rubbish trucks. He once had to go to the Sodor Steamworks to have his "scruncher" mended, and later that day, he helped Gordon tidy up the waste dump before the Inspector arrived.